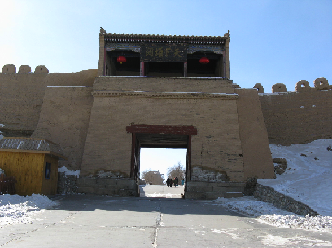 Jiayu Pass, built sometime around the year 1372 after Mongol troops were driven out in 1368. The fortress was strengthened following concern of an invasion by Timur that never came. The Mongols in China were ruling with a great variety of administrators, military personnel and hangers-on – Turks, Arabs, a few Europeans, Jurchens and Persians. The Mongols were following their tradition of supporting a variety of faiths: Buddhism, Islam, Taoism and the Christianity that was practiced also by some of the Mongols in China. China's Mongol emperor, Kublai Khan, died in 1294 at the age of seventy-nine. His grandson, Temur Oljeitu, succeeded him, made peace with Japan and maintained reasonable prosperity. Temur Oljeitu was a conscientious and energetic emperor, but after his early death in 1307 he was followed by a nephew, Khaishan, who appointed people without talent to positions of government, including Buddhist and Taoist clergy, and he spent money lavishly on palaces and temples and tripled the supply of paper money. Following Khaishan's death in 1311 his brother, Ayrubarwada, took power at age twenty-six. However competent Ayrubarwada was as a ruler, opposition rose against him at court by those who saw him as too sympathetic with the Chinese. He died in 1320, and his eldest son, Shidebala, succeeded him at the age of eighteen. Shidebala initiated anti-corruption reforms, sided with Tibetan Buddhists against Muslims and was assassinated in 1323. Shidebala was succeeded by Yesun Temur, who was oriented toward Mongol traditions. His supporters had been involved in the assassination of Shidebala, and he distanced himself from them and returned to the Mongol tradition of treating religions impartially. Yesun Temur died in 1328 and the youngest son of Khaishan, Tugh Temur, 24-years-old, took power. He was skilled in Chinese. He was a painter, supported education, lived modestly and dismissed over 10,000 from the imperial staff. Following Tugh Temur's death in 1332, a thirteen-year-old, Toghun Temur, became nominal emperor. His ministers ran state affairs. His first minister was concerned with what he saw as Mongol weakness in China. He re-imposed segregation between the Mongols and Chinese, decreed that Chinese were not to learn Mongolian, confiscated weapons and iron tools from the Chinese, outlawed Chinese opera and storytelling, and he considered exterminating Chinese. Across decades of peace, the ability at warfare of the Mongol warriors had been declining. Common Mongol troops had been put to work farming to support themselves, using slaves. Some of these Mongol warriors had failed as farmers and had lost their farms. Some had become vagrants, while Mongol army officers remained as a salaried aristocracy segregated from the common Mongol soldier. In 1346, plague had broken out among Mongols in the Crimea, and the plague spread to Mongols in China. Also there were floods that disrupted the country. Mongol military garrisons continued to rule at strategic points in China, but the Mongols were greatly outnumbered and were not prepared to contend with a great rebellion. Mongol military commanders began running the government, and Toghun Temur, now in his late twenties, passed into semi-retirement. He is reported to have taken pleasure only in boy catamites and in prayer with Buddhist monks from Tibet. Toghun Temur's debauchery and his devotion to Tibetan Buddhism added to Confucianist grievances, and opposition to Toghun Temur arose also among Buddhists. A secret Buddhist sect, the White Lotus, began organizing for revolution and prophesied the coming of a Buddhist messiah, Maitreya. Mongol rule in China was about 76 years-old when, in 1352, a rebellion took shape around Guangzhou. A former boy beggar boy who associated himself with a Buddhist temple but never actually became a monk, Zhu Yuanzhang, left his temple and joined the rebellion, and his exceptional intelligence took him to the head of a rebel army. 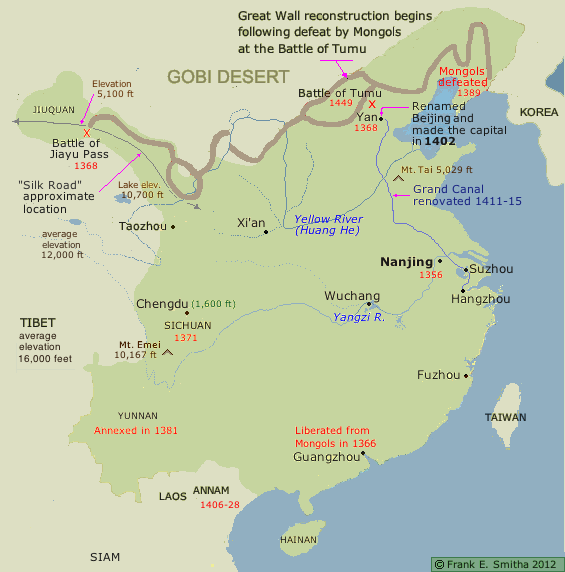 By 1355 the rebellion, accompanied by anarchy, had spread through much of China. Zhu Yuanzhang won people to his side by forbidding his soldiers to pillage. In 1356, Zhu Yuanzhang captured Nanjing and made it his capital, and there he won the help of Confucian scholars who issued pronouncements for him and performed rituals in his claim of the Mandate of Heaven. And Zhe Yuanzhang defeated other rebel armies. Meanwhile, Toghun Temur was still emperor, and during the rebellion in the mid-1350s the Mongols were fighting among themselves, inhibiting their ability to quell the rebellion. By 1368, Zhu Yuanzhang had extended his rule to Guangzhou – the same year that Toghan Temur fled to Karakorum. Zhu Yuanzhang and his army entered the former Mongol capital, Beijing, and with this he claimed the Mandate of Heaven. In 1371 his army moved through Sichuan. 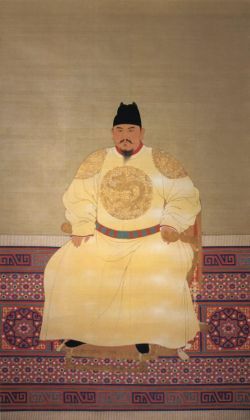 By 1387 – after more than thirty years of war – Zhu Yuanzhang had freed China of Mongol rule, and as China's emperor he founded a new dynasty: the Ming.